Pacific Northwest Ballet company dancers in Crystal Pite’s "Emergence"
This is an essay about Crystal Pite's "Emergence" at Pacific Northwest Ballet. I'll put my cards on the table upfront: I loved it. But I need to give you a little history before I explain why the dance was so great. I can't pinpoint the exact moment when I fell in love with dance. Like a lot of little girls, I took ballet classes. Frankly, I was too pudgy, too uncoordinated to pursue the art form. I do remember decorating endless school notebooks with drawings of feet in pointe shoes; no doubt I was trying to entertain myself during lectures I should have been avidly consuming. My hometown didn't have a resident ballet company, and Detroit wasn't a regular pitstop for touring dance troupes. But they must have trudged through there from time to time because I can recall a performance by Margot Fonteyn and Rudolf Nureyev: she, seated in a chair, while he spun a web of leaps around her. Luckily, I transplanted myself to Seattle 35 years ago where a bounty of dance is on offer, like the sumptuous deli at Metropolitan Market. From Pat Graney's seminal work "Faith" to Zoe/Juniper's "A Crack in Everything" to Olivier Wever's "Monster" to Ezra Dickinson's "Mother for you I made this," local artists feed my addiction to dance. They continually push me to seek out another fix, something to propel my spirit to the dimension that the best art reveals. And now we arrive at the crux of this essay: choreographer Crystal Pite. I first saw her company Kidd Pivot at Seattle's On the Boards (itself a gem of a place). My friend Jessica urged me to check out the show "Dark Matters." Despite a touch of food poisoning, I went. And to be a little melodramatic, the experience was mind altering. In that single performance Pite had distilled story, music, movement, and aesthetic, tied them together in a package that now defines great art for me. I was provoked to think, my senses were delighted, and I left On the Boards fully satisfied. If you've followed me this far, you're probably thinking, "All right already, but what about 'Emergence?' 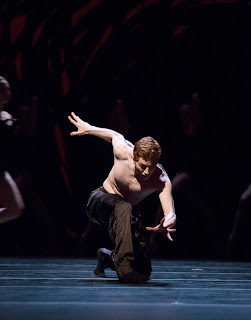 "
Andrew Bartee in Crystal Pite’s "Emergence"
"Emergence" is about the hive mentality, about the contradictions inherent in a society that exists on a communal cooperative ethic but where individual egos yearn to be noticed. Not unfamiliar ground for artists or for philosophers, or really for anyone. What makes "Emergence" such an experience is how Pite translates these big questions to the human body. She re-envisions the hive mind literally: a dancer is hatched, angular and twitchy; she emerges with help into her world. It's an army of massed, fellow insects whose limbs pulsate up from the stage floor, counting their cadence out loud. The women, arms crooked at the elbows and held back behind their torsos, march on pointe across the stage like walking stick insects. They line up, an Amazonian force field, to defy their hapless mates from penetrating their ranks. One breaks through in a menacing version of the child's game Red Rover. He shudders out a dervish solo to Owen Belton's hypnotic score. Dance at its best is a primal, non-verbal portal to our emotions. The visceral experience of "Emergence" defies capture by words—or at least by my words. I brought a young friend to opening night, someone who told me before the show that dance just doesn't do it for her. She remained untouched by the three Jiri Kylian dances that preceded "Emergence" on Pacific Northwest Ballet's bill. But after "Emergence," she turned to me, eyes bright, a crack in her hipster cool facade, "That makes me want to see ballet again," she said.